Edward Burke says that I owe the “City of Keene” 15FNRs or else. This, despite the fact that no victim could be pointed to by Keene police employee Lesley Collier, who back in March left a ransom note on my Tahoe. Nor could Collier point to any property damage that I had caused or even a single complainant. To be clear, the ransom Burke says I owe is demanded simply because I disobeyed a decree that I never signed, which was written by some strangers I never met. This was originally posted to CopBlock.org on May 6, 2013. On March 23rd, 2013, after hanging with some friends at the Keene Activist Center, I decided to roll out. Unbeknownst to me, about 100′ feet away Lesley Collier, an employee of Keene police department, was at that time placing a ransom note on my Tahoe. So, I didn’t read the ransom note. It remained untouched, under my windshield wiper, for a couple days as I drove around town. But, after talking with some friends, I decided to address it, simply because I recognized it as a death threat. I stopped by the headquarters of the Keene police outfit. There I saw a box where many unthinkingly pay ransoms they receive from Collier and his colleagues, which only perpetuates and sets the stage for more such “legal” shakedowns. I instead communicated that I was not going to fund their criminal outfit. I was told to appear in legalland on May 1st. I’m now told to return on August 19th. Do you believe this process is about justice? If not, then as best you can, stop granting it allegiance. Why not act according to your own conscience rather than to text on paper conflated as law. Essentially what I’m doing is damage control. If I had ignored the ransom the amount demanded would increase. Next would be more frequent, and different methods of contact. Eventually, some active with the same criminal organization may claim to be “justified” as they attempt to kidnap and cage my person. If I resisted, they might initiate lethal force and claim “immunity”. And for what? Collier’s ransom note said that I disobeyed an alleged ban on parking on public streets overnight during the winter. I certainly don’t grant authority to Collier and the rules he cites simply because its claimed. The removal of snow wasn’t an issue on the night in question. There was no victim despite Jean Kilham communicating otherwise in her response to my motion to dismiss. The defendant alleged there was no victim. As we each conclude that we shouldn’t apologize for actions that harmed no one, that we don’t owe a debt to make some fictitious entity whole, the sooner we live free of individuals claiming the right to initiate force. We’ll see what happens. If the threat levied isn’t dropped I expect to sit half a day or a day in a cage. Hopefully it gets some folks to think. At least I know I’m being true to my conscience. So You’ve Been Wronged by a Police Employee? Have a not-too-favorable interaction with a police employee? Check out this page: http://copblock.org/29382/so-youve-been-wronged-by-a-police-employee and consider letting others know via http://copblock.org/submit The more we each speak the truth and look out for each other the better we’ll all be. David Lauren, the person pursuing the ransom against me on behalf of the “City of Keene”, plans to, tomorrow, Tuesday, August 06, 2013, in Keene District Court, object to the content I shared with him as part of my discovery. 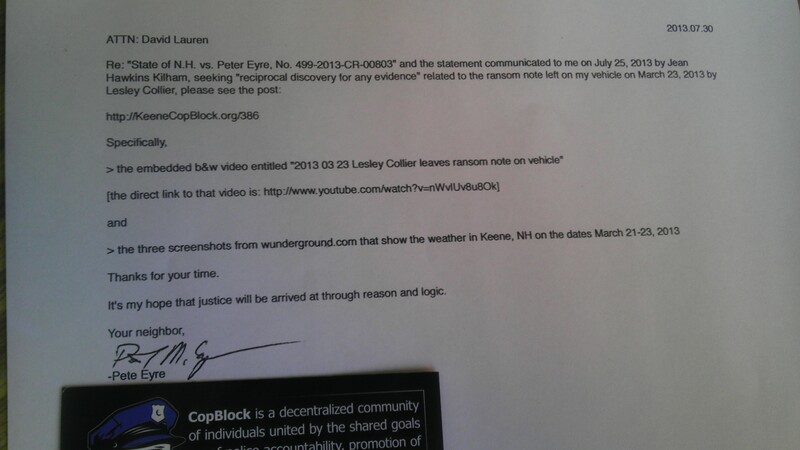 Specifically – video from the night Lesley Collier, Keene police employee, left the ransom note on my Tahoe, and three screenshots from wunderground.com that showed that there was no precipitation that night, nor the previous two nights. Will David Lauren Acknowledge There Was No Victim and Thus No Right to Demand Payment? Just before 4pm today I dropped-off this note addressed to David Lauren at the Cheshire County Attorney office. I had previously called and left a voicemail with Lauren and inquired how best to point out to him some content I think relevant to the threat he and his colleagues have levied at me for the victimless act of parking my truck on a clear street.